Stonehaven is the county town of Kincardineshire, 15 miles south of Aberdeen in the North East of Scotland. If you are planning to visit for the Highland Games in July, it is well worth considering spending a few days exploring the area. 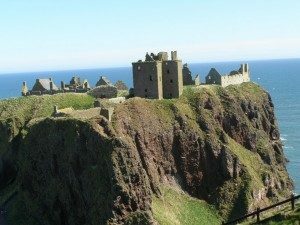 There are many visitor attractions such as the iconic Dunnottar Castle which was recently used as the location for filming the modern version of Frankenstein, starring Daniel Radcliffe, well known star of the Harry Potter films. The harbour is one of the finest in the country with excellent hostelries for food and drink. If you are interested in local heritage, The Tolbooth Museum is well worth a visit. For more information on Stonehaven please visit www.stonehavenguide.net.